Communicating God's life-changing truth of the Gospel of Jesus Christ to as many people as possible, is the reason we established Good Shepherd Fellowship Church’s Web Site. In the GSFC web site, we have provided access for you to receive ministry from the Word of God. Upon graduation from Bible Collage, Andrew worked volunteering his services with the late Pastor James Sallgren of Twin City Interfaith Fellowship, in Menominee, Michigan. In July of 1991, under the prompting of the Holy Spirit Good Shepherd Fellowship Church began in a little storefront building at 1329 Main Street, Marinette, Wisconsin. We remained in that facility until September of 1999, when we moved into the Jewish Synagogue at 818 Pierce Avenue. We remained there until March of 2004 when we bought the facility where we are now located. Andrew Williams born in Menominee, Michigan. graduated from WOFBI (Word of Faith Bible Institute) in 1988. 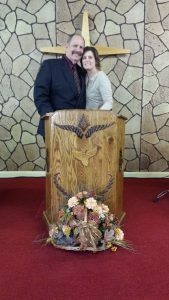 Bonnie his late wife attended the same school while ministering the Word of God to a lost and hurting world around them. Andrew and Bonnie were married March 22, 1975. Bonnie went to be with the Lord in 2011, she will be missed until that great day the Lord reunites us all. Pastor Andrew married Janet Fox in 2012, they enjoy their life together, with their new extended family. April 28, 2019 – Healing and Communion Service 6:30 PM. May 12, 2019 – Holy Communion Service 10 AM. May 12, 2019 -No PM Service, Happy Mother’s Day! May 26, 2019 – Healing and Communion Service 6:30 PM. Find map to the church on our “Contact Us” page. All events are subject to change without notice fully at the discretion of Good Shepherd Fellowship Church.